Busyness is almost worn as a badge of honor today. Yet, when we look back on a busy day, week, month, or season, we must ask ourselves what benefit came from the busyness. We must also consider what we gave up, ignored, or lost due to our busy lifestyle, especially as it relates to serving and living for Christ. This week's Explore the Bible study will focus on this very subject: Seek Him First. God called Haggai to remind the people of the priorities of life because they had become so focused on other things that the House of God (the temple) sat in ruins. Their lack of attentiveness to the ways of God, not only revealed the distance between them and God, but it hurt God’s witness to a watching world. Does your lifestyle lead you to focus on everything but living for and serving God? 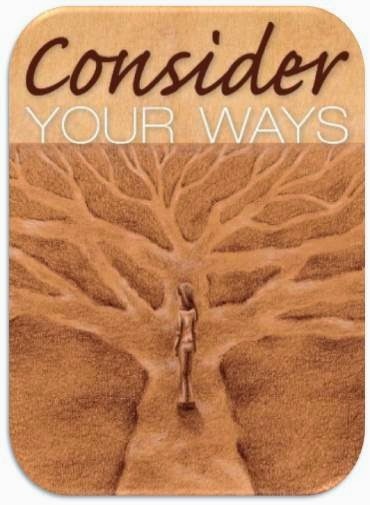 I have provided an optional PowerPoint that includes the image above which is the question God tells Haggai to propose to the people: "Consider Your Ways." This is what we and our groups should do as we study the passages. The PowerPoint also includes a timeline that helps contextualize the study as it relates to the returning exiles and the book of Ezra. I suggest you read Ezra 4:24 - 5:2 to understand the ministry of Haggai in the context of the events taking place in the book of Ezra. Register to receive 4:12 Network Updates on Explore the Bible teaching helps and other regular 4:12 blog posts. If you need training for your Bible study group leaders, check out the 4:12 Network. If you need further information about curriculum, see the Explore the Bible page.